It’s a PMOS/NMOS H-Bridge with FETs that can handle 3 amps or so, plus a SPI current sensor, some switches & a rotary encoder (not stuffed yet), and a 7-segment display, all controlled by a Teensy-3.1 running FreeRTOS. I made this because I’m always running into battery, power, inductor and transformer issues I don’t have any experience with. The idea is to use the H-bridge configuration and current sensors to experiment with moderate-current PWM, motor control, power-line synchronization, battery charging and discharging, etc. This entry was posted on Thursday, February 19th, 2015 at 7:00 pm	and is filed under hacks. You can follow any responses to this entry through the RSS 2.0 feed. You can skip to the end and leave a response. Pinging is currently not allowed. it’s nice and cute, but i don’t recommend this hbridge architecture for an experimental project. – implementing an overcurrent cutoff in HW is a good idea for avoiding the smell of burnd mosfets, especially when dealing with experimental setups. 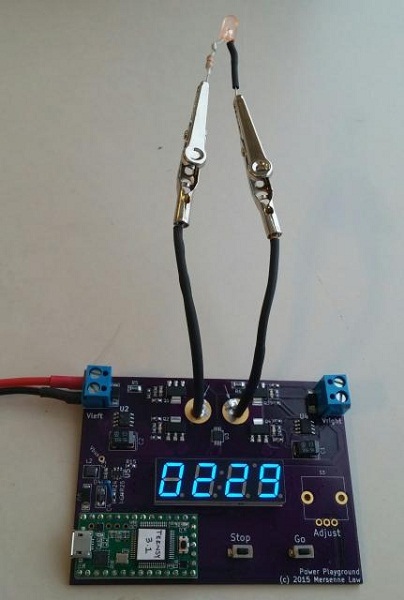 – don’t forget an overvoltage clamp that can handle a high power. It’s crucial when your motor goes into a generator quadrant, even more if your hbridge cannot handle an overvoltage.